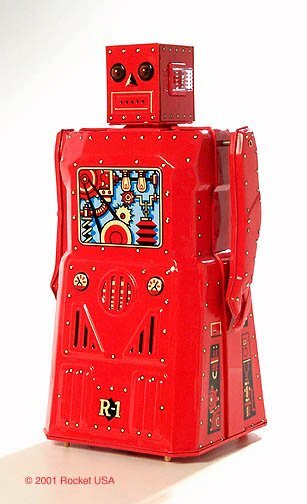 THIS IS THE NEW RED R-1 ROBOT. 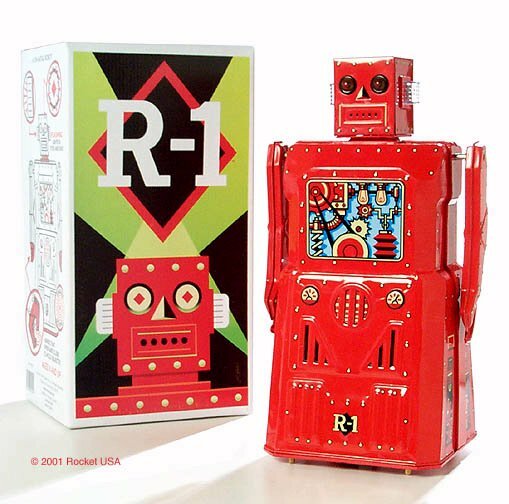 ROCKET USA AND THE RED TOY HAVE JOINED TOGETHER TO BRING YOU A SPECIAL LIMITED EDITION OF ONLY 450 RED R-1 ROBOTS COMPLETE WITH THEIR OWN UNIQUE BOX AND HAND NUMBERED CERTIFICATE OF AUTHENTICITY AND OWNERSHIP PAPER. THE RED TOY WILL BE THE EXCLUSIVE DISTRIBUTOR OF THIS ROBOT, AND IT WILL ONLY BE AVAILABLE AT THE RED TOY. THE ROBOT IS CURRENTLY BEING MANUFACTURED AND SHOULD BE READY TO SHIP ON JUNE 11, 2001. WITH ONLY 450 OF THESE BEING MADE I EXPECT TO SELL OUT OF THEM IN A SHORT TIME. HE IS ALL TIN, 12" BATTERY OPERATED, BUMP-N-GO SKIRT STYLE ROBOT. THIS IS NOT A REPRODUCTION OF AN OLD ROBOT, BUT AN ALL NEW ROBOT IN THE STYLE OF THE GANG OF 5 ROBOT. MADE BY ROCKET USA, QUALITY TIN TOYS WITH ATTENTION TO DETAIL, HE HAS FLASHING EYES AND EARS,EMBOSSED METAL, AND THE FLASHING IS VERY COOL, LOOKS MORE LIKE STROBE LIGHTS. IT HAS A VERY SMOOTH BUMP-N-GO ACTION. RED IN COLOR WITH NICE TIN LITHOS. MINT IN BOX..... $55.00... Buyer pays shipping and handling charges of $8.00 .